If you don’t know, Pinterest is my BFF. You know why? Because it’s totally growing my blogs….yes I said blogs. My traffic has been growing much more when I started scheduling my pins using Tailwind (a scheduling tool). When this happened, I grew my pageviews to now 42k! If you’re new to Pinterest, this post won’t really help you (sorry). But, if you are using Pinterest for fun, I want you to start using it for marketing your freelance writing services. And one of the best things you can start on Pinterest is to use group boards. Group boards are a collective board on Pinterest where collaborators can pin to that board. If the owner has a big following (or that board does) then that means your pins can be seen by thousands of new pinners. Those pinners could be editors, marketers, CEOs, bloggers, solopreneurs, entrepreneurs, small business owners, authors and more. You can be in front of those potential clients and behold, they could email you and ask you to write for them! Yay! It’s happened to me. 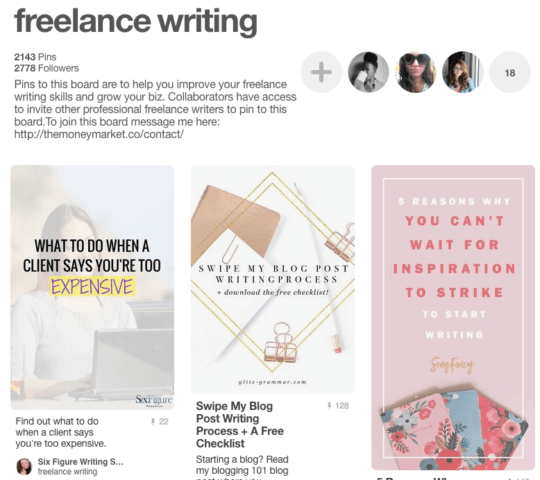 Okay, now that you know why Pinterest is a BFF for freelance writers, let’s look at some group boards just for you. 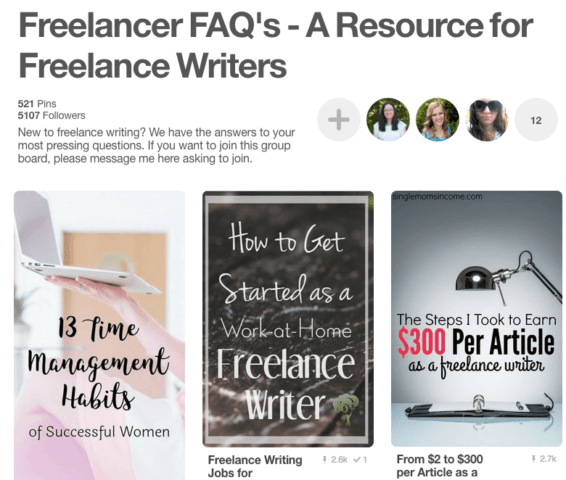 So, recently I revived it by inviting more freelance writers that want to pin to that board. Now, it’s lively and pinners are noticing it! 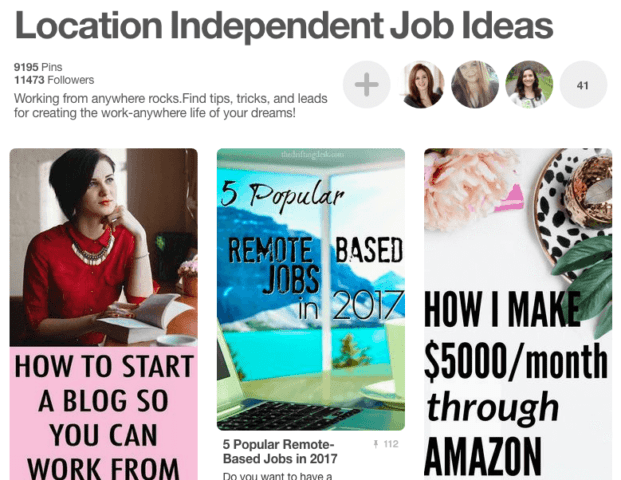 If you blog about job ideas, money making ideas or career ideas, this group board is for you! With over 11k followers, it’s worth sharing your pins on this group board. For freelance writers, your blog may have some good posts about working from home right? For a lot of us that’s what we strive for, want or are trying to do full-time. If you have posts in that niche topic, join this group board to share those posts! This is a straight forward group board around freelancing and management. 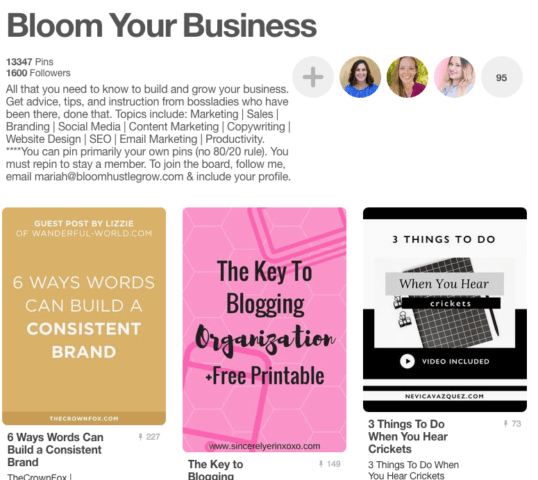 If you blog about business type topics, this group board will help you drive more traffic to your blog and maybe get a client! 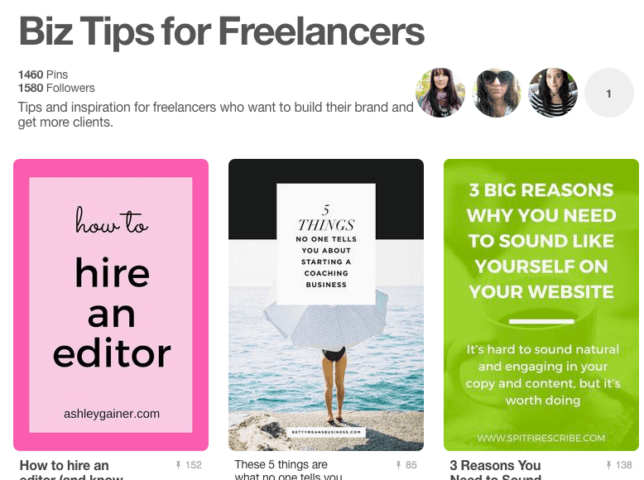 This board has the best tips to help freelancers. 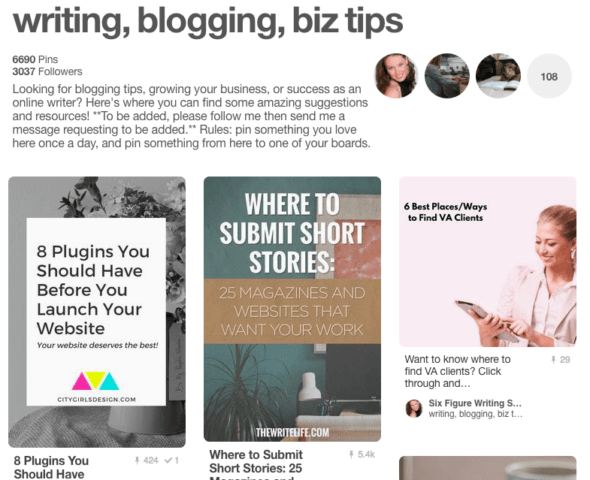 With productivity, organizing and inspiration tips, this board can help you with sharing your posts on these topics. As a freelance writer, we may write about…well, writing of course! 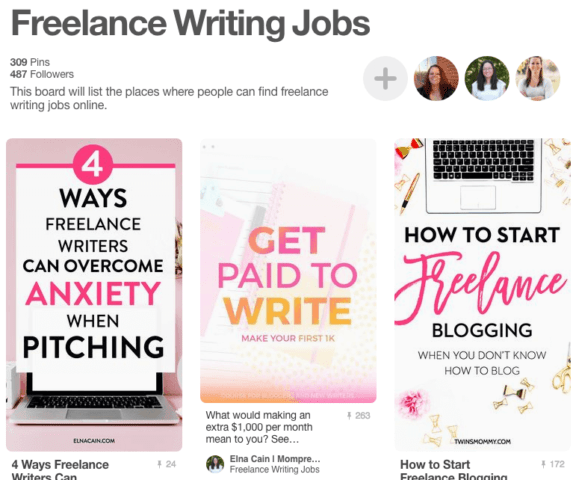 🙂 This group board shares tips for freelance writers about writing. 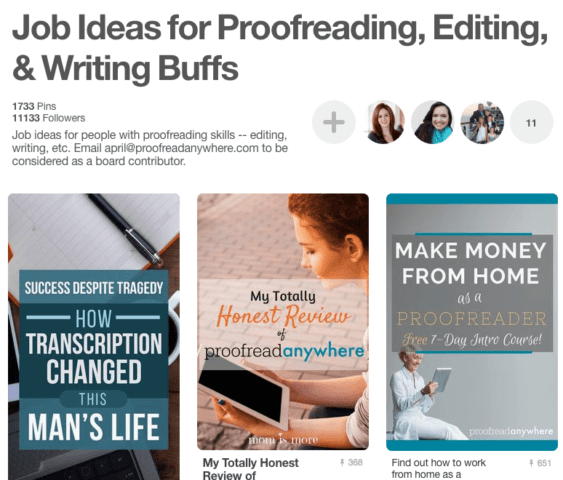 If you’re an editor or proofreader, here’s the board for you! 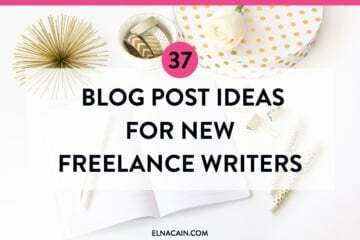 Along with freelance writers, you can share your posts about your service ideas! 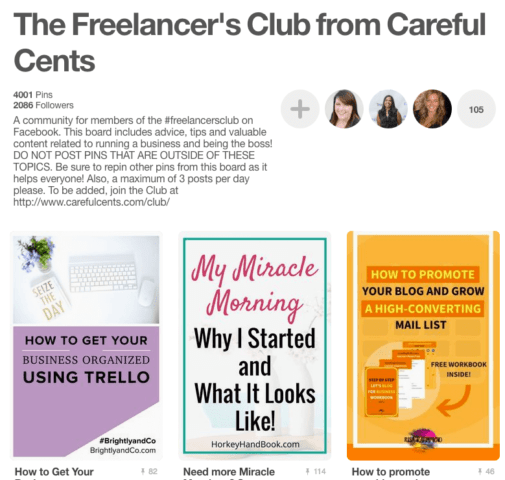 Carrie Smith from Careful Cents has an awesome Pinterest group board! To join make sure you are part of her Facebook group first! 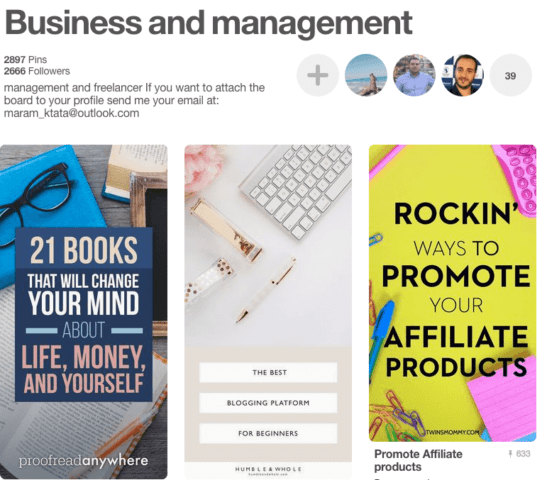 If you blog about your service as a freelancer, this group board about entrepreneurial topics can help you reach new pinners. My dear friend Lorraine Reguly of Wording Well has a Pinterest group! She doesn’t let you know how to request an invite, but perhaps contact her via her blog? This board gives tips to improve your freelance writing. If you blog about those things, then join this group board. 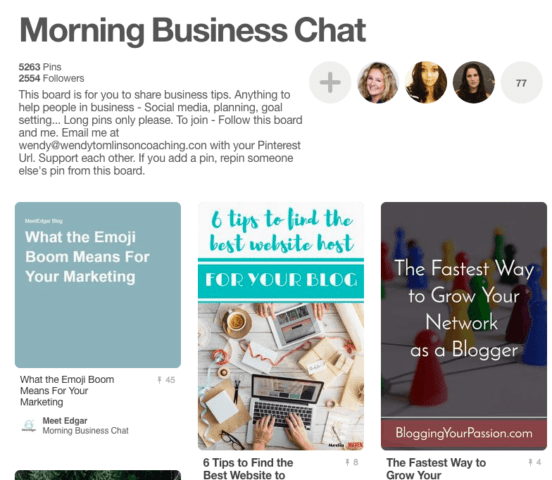 If you give business advice on your blog, this come and join Morning Business Chat! 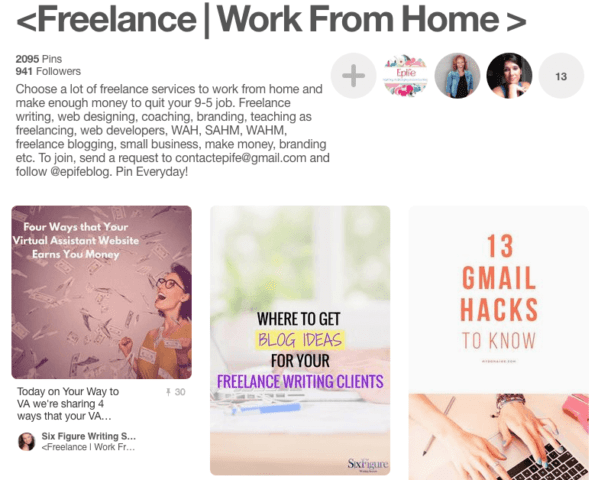 Cori of Not Now Mom’s Busy has a Pinterest group board for freelancers! 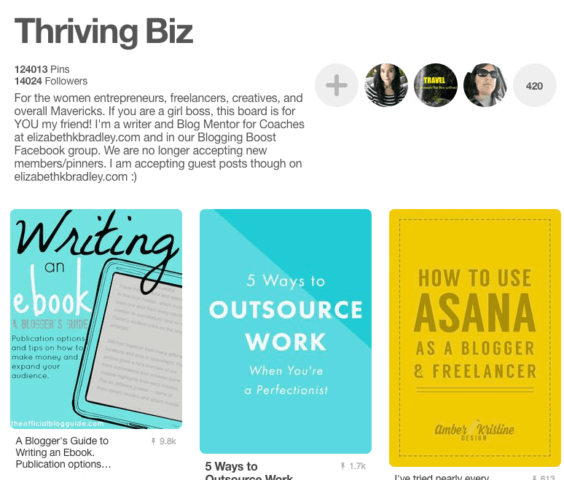 Share your pins about business, entrepreneur tips and freelance writing/editing and more! As a freelance writer, we are also an entrepreneur! We sure have a business and for a lot of us, we write about our business. Here’s a Pinterest group board to share those posts. Use this group board to share tips to attract clients! Oo la la, marketing your business to attract clients is my ideal way for sure! 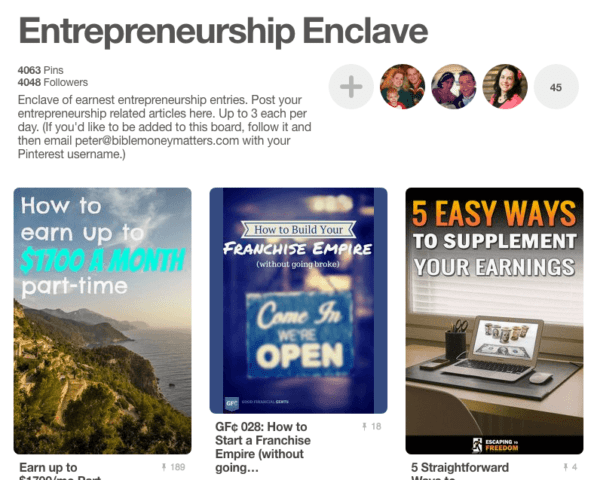 If your posts are related to entrepreneurship topics, then you can share your posts on this group board! This is a small group board, but if you message the owner, I’m sure you’ll be able to contribute to this board. 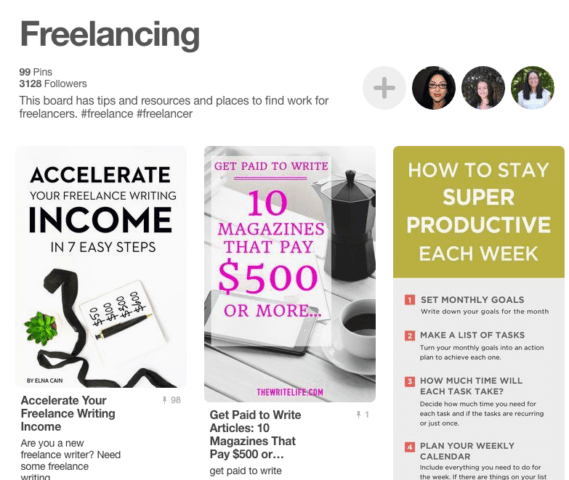 A group board to share your tips to help other freelancers be successful! 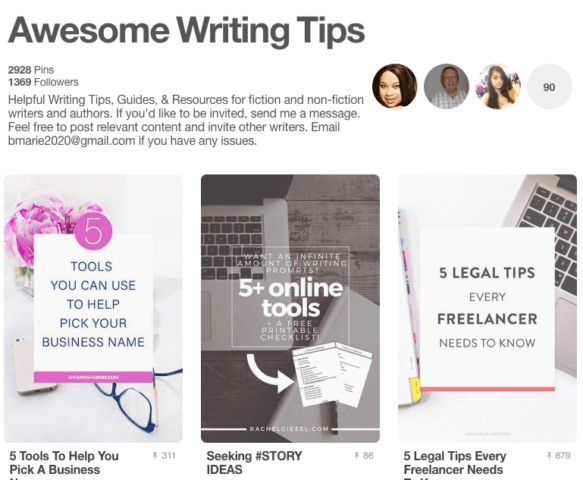 Share your writing tip posts on this group board and get noticed by more pinners. 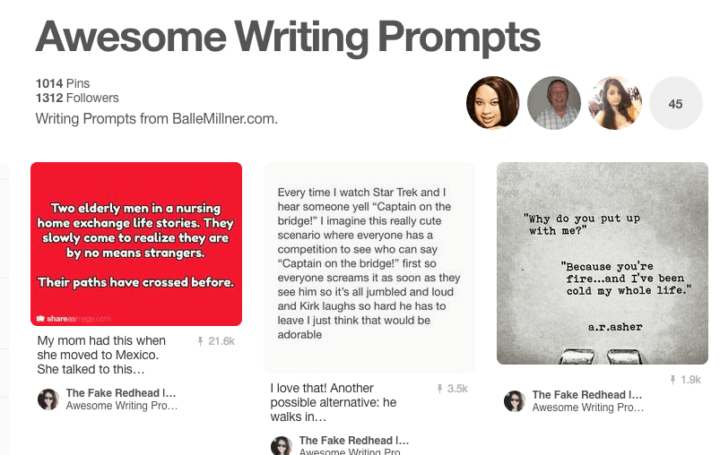 A group board to help boost your writing skills with prompts. This owner also owns the Awesome Writing Tips board too so when requesting an invite, make sure to state which board you want to contribute to (or ask for both). 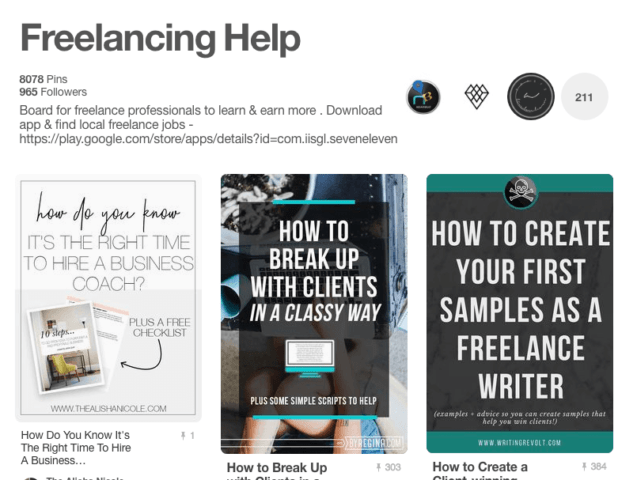 For pins about getting more clients, improving your freelance service and more. Join this group board by either emailing the owner, messaging them or comment on one of her pins. This is a group board, but I’m not sure if the owner is still adding more contributors. But, if you are a copywriter (or even a freelance writer) and have tips about those topics then you can try to join this group board. This group board has topics about business, making money and anything related to those topics. It has a huge following, which means your pins will get seen by a new audience. 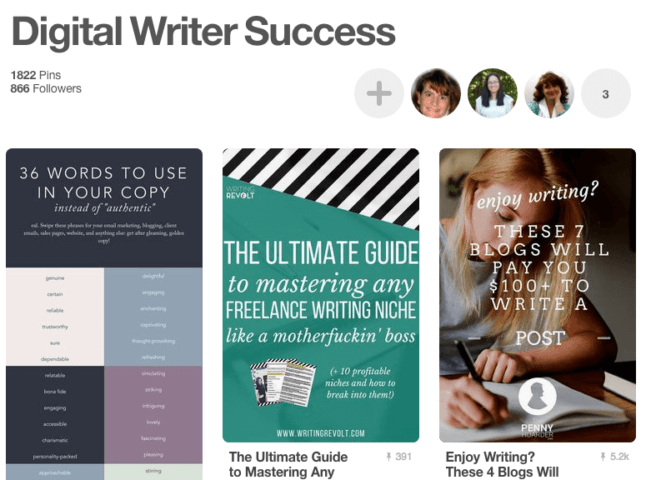 This group board is for freelancers like writers, designers, coaching and more. Share your business tips to help others. 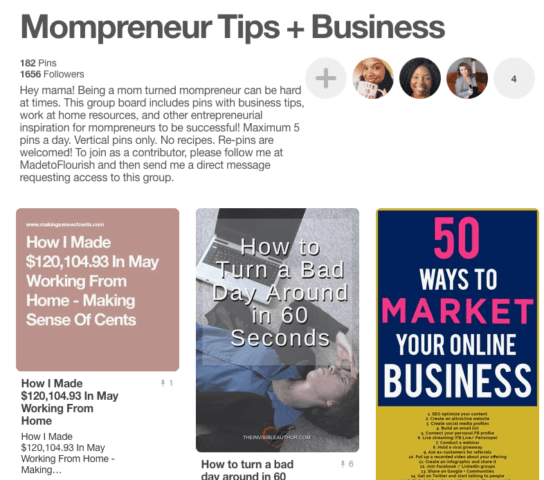 This group board holds pins about helping others to grow their business. 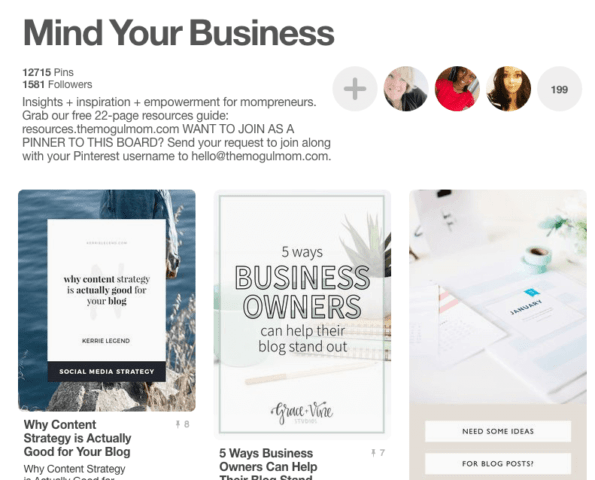 If you blog about your service and how you are growing your business, then this group board can help you out! Share your awesome posts about helping others with their freelance business. 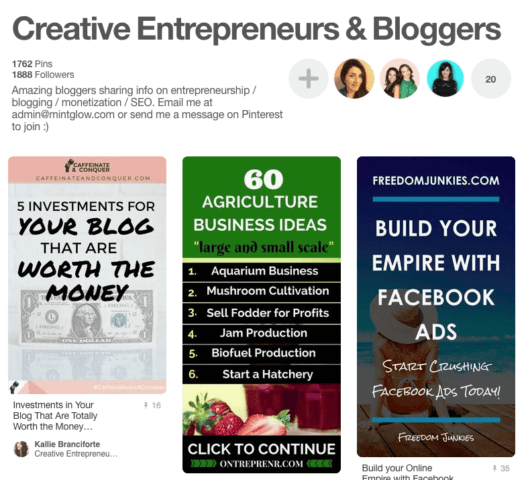 This group board helps entrepreneurs and bloggers be more successful! 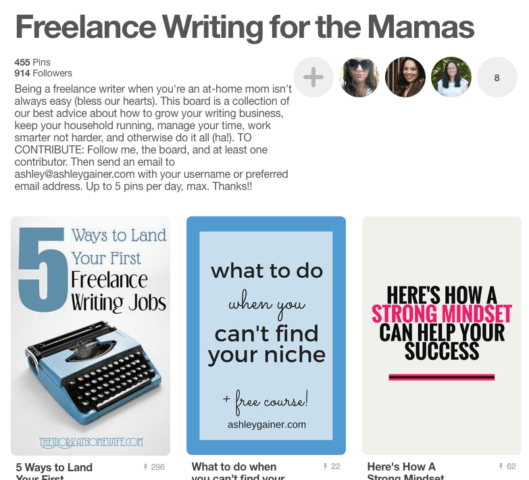 If you are a mom freelance writer, this group board is for you! Share your awesome business tips in this group board and starting growing your traffic. If you have a laptop and want to be an entrepreneur or freelancer, then you can share your tips on this group board. Just direct message the owner that you want to join! Share your tips on how to grow your blog or business on this group board. 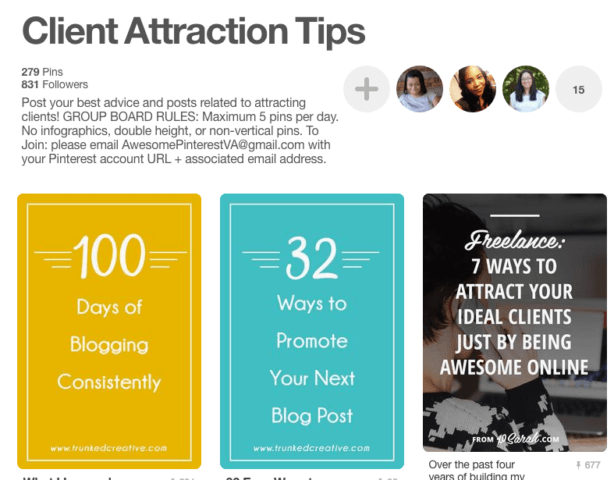 With over 3k followers, this is a great board to get more eyes on your blog. If the group board owner does have requirements, make sure to read those and follow them. Some of them may have you follow them and their board or fill out a form or first join their Facebook group. If you fail to provide those things, the owner may not invite you. Good luck on joining Pinterest groups and I’m sure you’ll be getting more traffic soon on your blog! Yay! 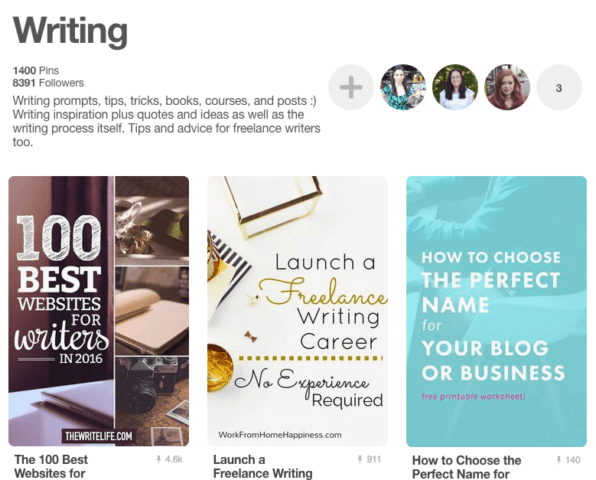 Let me know if you have a Pinterest group board for freelancers or freelance writers! I would love to include you in this round up! Guess what? 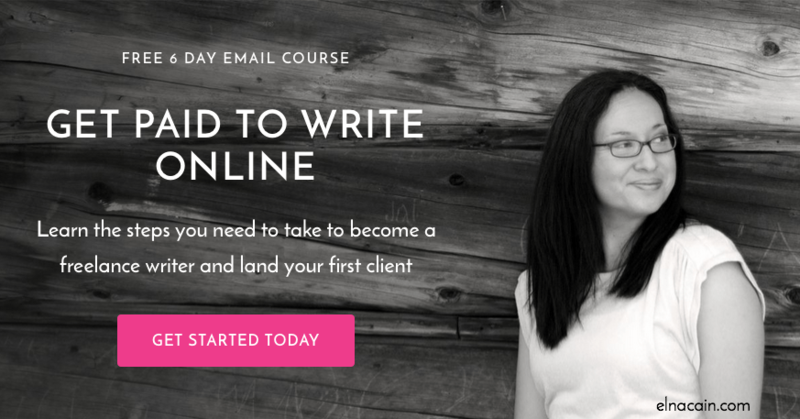 I have a free course on getting paid to write online. GOOD NIGHT this is a super helpful article! Thank you so much for putting these together! I swear, halfway through I had ten tabs open, and all of them were such great group boards. Thank you again! Glad you found some great groups to join! I was stuck up with what can I do with my Pinterest account. 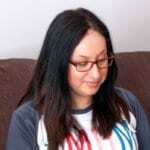 Thanks Elna for your sound info.Before reading your article I never think about Pinterest group boards.Your points have changed my perceptions and now I think as a freelancer I can write more effectively.Like to tweet it. Pinterest seriously as a marketing platform. After reading your whole content I learn something new. I feel it’s time to branding myself in Pinterest. Good Elna! 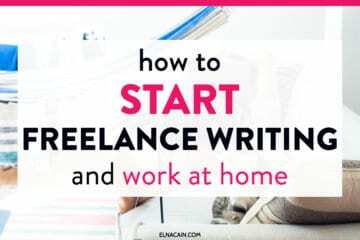 The blog is really helpful to know the basic important info to become a freelance writer, how to write catchy stuffs to attract clients and to become and successful Entrepreneur. Thanks! So glad you found some good group boards to join! 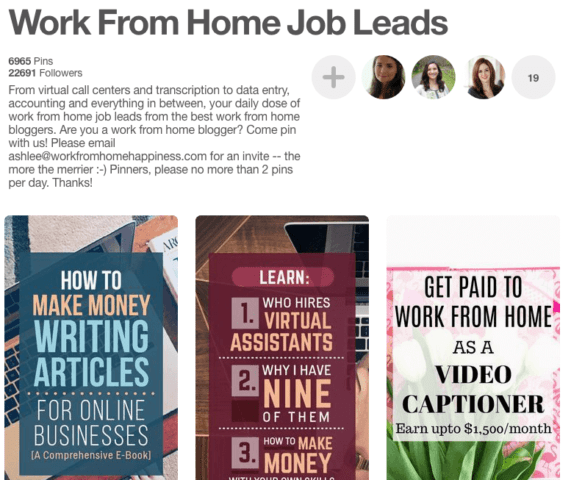 Once again an Awesome post that you have written, it was really awesome actually I have never used Pinterest board groups for freelancing purposes. It is really good to learn about these groups. I am feeling now like a champion. Pinterest is a great source of referral traffic. There is a lot of potential audience on Pinterest but all we need an appropriate medium to reach to our audience and on Pinterest, Boards are that medium. Your Post is really helpful for all those people out there who need content writing or content writers. Finding quality writer is a pain these days. Maybe I ‘ll find some great writers through these boards. Really very good article. This is help me a lot in Freelancing. Thank you so much! Glad you found some new Pinterest groups. Wow! These are amazing Pinterest boards. 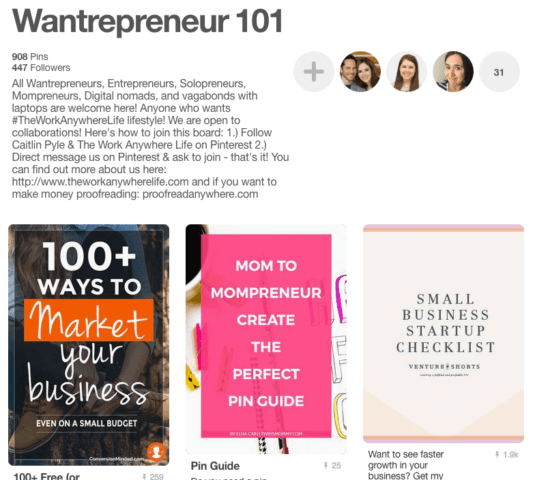 I have never really taking much time to study Pinterest but the result you are showing here is beginning to make me pick interest in it for my business blog. Freelancer FAQs, Rebel Entrepreneurs and Client Attraction Tips will surely be my favourite. Great post! I’m just starting to build my Pinterest account and join group boards. Now I’ve got a list to start with! Thanks Elna. Glad you found some good Pinterest group boards to be on! Good luck! Excellent article. I’ve been using Pinterest for some time but never understood it’s potential. I will have to revisit it now! Yes, Pinterest is a great place to boost your traffic and get some clients too! What an incredible list you’ve provided us. I only knew of a few of them such as “Freelancer FAQs, Copywriting, etc. In fact, I’m booking this post for future references. Thanks for posting. Thank so much! Happy you found some great boards to join! Hey, can you update this post under my board? I just edited it and told others how to join it! Great Mam just a newbie in freelancing and your article helped me a lot. Quality time spent on reading this article delivered a great value to newbies like me. Thank you so much for this list. 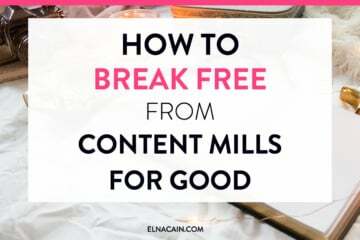 I am in the process of reading all your posts and actionable advice on using Pinterest to promote and grow your business. My head is spinning! I have emailed/messaged and pinned so much the last few days in an attempt to join heaps of group boards and get my name out there. I cannot wait to see where it leads. Fingers crossed I have as much or even half the success your posts talk about! Crossing my fingers that you get on some group boards. For more Pinterest posts check out TwinsMommy.com! This is amazing! I never quite knew how to join these kinds of boards, so this will really help. This is on my to-do list for tomorrow. Thank you! 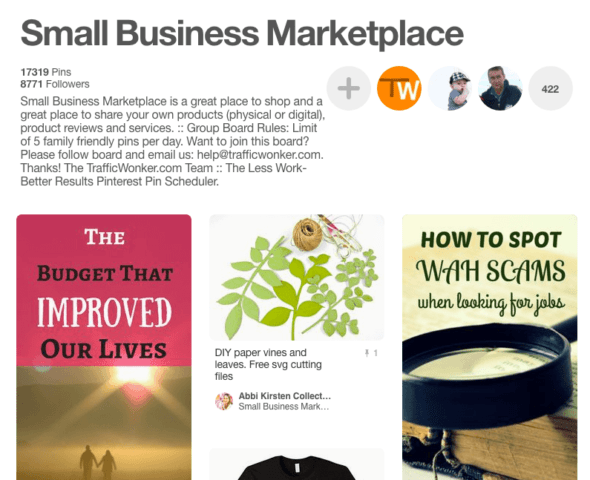 Glad you found some Pinterest group boards to grow your business! Thank you so much for this list! I’m on some of these, but you definitely had ones tat were new to me. I’ll have to check them out. I know I’m not utilizing Pinterest to its fullest potential! That’s great! Have fun on Pinterst! Hi!! This is really a good article. I am gonna bookmark your blog for future. Thanks! Glad you are exploring Pinterest for a marketing strategy! That’s great to know! 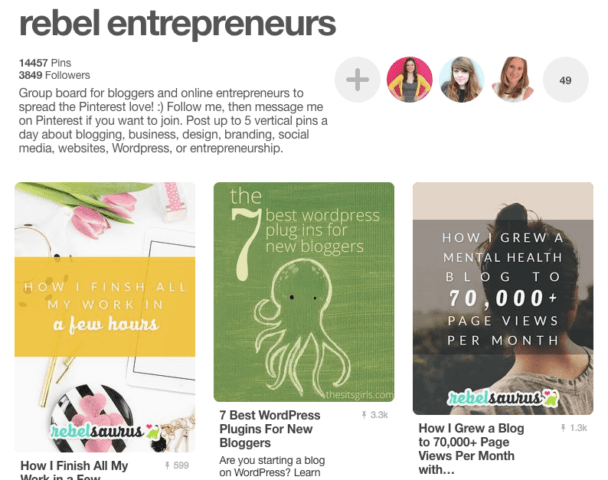 I love using Pinterest and it’s a great marketing tool for your blog and services! Hi, Very good article. It’s very helpful for everyone. Thanks for sharing & Keep it up. Every professional and freelancer should focus on getting every single opportunity. 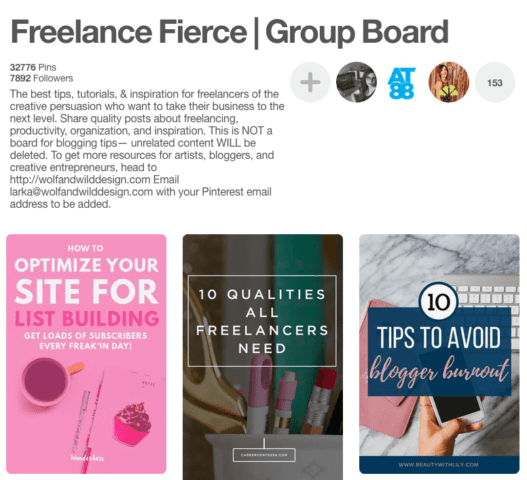 I have never used Pinterest board groups for freelancing purposes. It is really good to learn about these groups. That’s great to know. 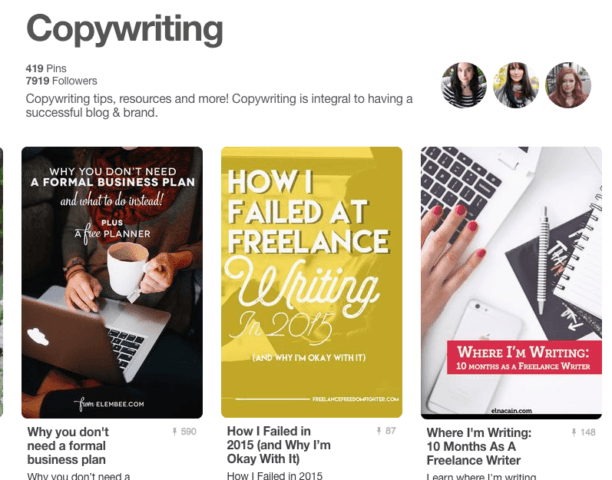 I love Pinterest for marketing my blog posts! Another great post full of useful tips. How well should I know the writers, bloggers, freelancers, etc I invite to my board? I’d at least comment regularly on their sites, but I’m just wondering if I need a stronger relationship with the person. You can just email them and ask to be invited! You don’t need to know the bloggers who have the group boards!